Larger than life and created from highly polished steel, Michael Parekowhai’s The English Channel is an arresting sculptural presence. The figure, with flowing topcoat and ponytail, is the British navigator Captain James Cook. 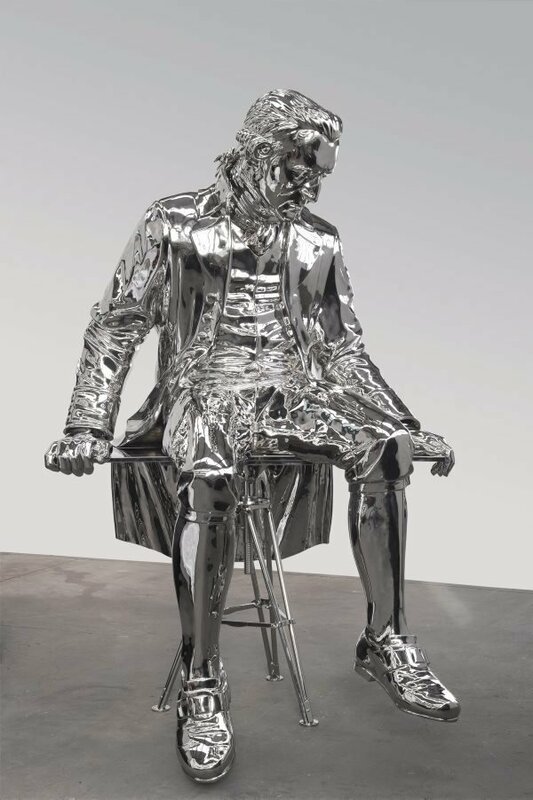 But this is not Cook as he is seen in the many historical monuments that bear his name – or in the famous 1776 portrait painting by Nathaniel Dance which is one inspiration for this sculpture. Resting on a sculptor’s working table with his feet suspended above ground, this Cook seems to be reflecting on his legacy in the contemporary world. At the same time, his dazzling surface collects the reflection of everything around it – including viewers looking at it. Despite the sculpture’s considerable height and weight, this mirror-like surface lends The English Channel a slippery and elusive presence, as if to suggest how perceptions shift depending on where one is standing. This charged relationship with place was heightened, in the sculpture’s debut presentation in Sydney, by its physical location within the Gallery, in front of windows overlooking the harbour that Cook sailed past in 1770. The result is a monument of a very contemporary kind – not a full stop marking the end of a story but a question mark inviting response and reflection.